Our Facebook event page for the Great Los Angeles Walk 2010 is up -- access it here. One Month Until the Great Los Angeles Walk -- Shirts Now Available! Believe it or not, we're now less than a month out from the annual Great Los Angeles Walk -- our annual urban hike from downtown Los Angeles to the ocean. This year, as we previously announced, we're heading BACK TO WILSHIRE. The walk takes place on SATURDAY, NOV. 20, 2010. MEET AT 10 A.M. AT PERSHING SQUARE IN DOWNTOWN LOS ANGELES. In 2006, we hiked down Wilshire. In 2007, it was Pico. In 2008, we started at Sunset before walking the entire length of Santa Monica Blvd. And in 2009, we explored L.A.'s historic West Adams district, walking a mix of Adams and Washington all the way to Venice. The route will take us past some of L.A.'s most iconic and historic features -- MacArthur Park, Bullocks Wilshire, the sites of the late great Ambassador Hotel and Brown Derby, and much much more. We're working with the L.A. Conservancy, which is updating its guide to all things Wilshire in time for the occasion. And as usual, we'll celebrate afterward at a location to be named later. If you'd like to host the post-walk event, or at least help organize it, please contact us at our franklin_avenue(at)yahoo(dot)com email address. For those of you new to our annual event, it's quite simple: We walk. No agenda, no cause, no special reason -- just for love of Los Angeles. It's the Saturday before Thanksgiving, which means you can work off some pounds in preparation for the following Thursday's pigout. And this year's walk is just 15.6 miles -- the shortest of the ones we've done. 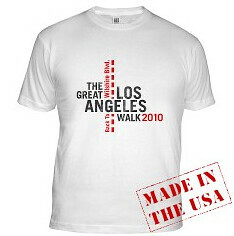 T-SHIRT INFO:Time to order your GREAT LOS ANGELES WALK shirt! Like the last few years, we're going through Cafe Press for the shirts. And like always, we're not making a dime. The price you pay is the price that Cafe Press charges. 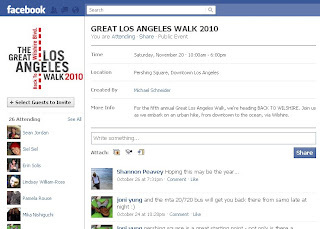 And keep checking out the official Great Los Angeles Walk website -- GreatLAWalk.com -- for more details! We'll see you on Nov. 20.